Because of the low Reynolds number at which microorganisms live, they are excluded from any type of feeding that makes use of the inertia of the prey or their own bodies. At the same time, they are too simple to have elaborate organs such as complex eyes, which would enable them to perceive potential prey at a distance, and too small to react swiftly to chemical gradients. Thus, they are dependent on passive contact of their feeding structures with potential food organisms. They can improve the chances of this happening by swimming or generating feeding currents. The feeding mechanisms employed by heterotrophic microorganisms can broadly be divided in three categories: diffusion feeding, interception feeding, and filter feeding. Diffusion feeding is the simplest form of feeding and involves passively waiting for motile prey to make contact with the feeding structure. This is not a widespread feeding mechanism but is used, e.g., in the heliozoan Ciliophrys, which is immobile with extended pseudopodia when feeding; Ciliophrys, however, is capable of contracting its pseudopodia and swimming when threatened . In interception feeding, organisms swim or generate feeding currents and intercept particles that make contact with a feeding structure, such as the flagellum in Paraphysomonas . An interesting and unusual example of an interception feeder is Noctiluca scintillans, which is not in itself motile but is capable of moving by being positively buoyant. In this way, it encounters food particles, often using a long thread of mucus to which the particles attach. It can control its velocity to some extent by altering its buoyancy by swelling; it moves approximately three times faster if starved . 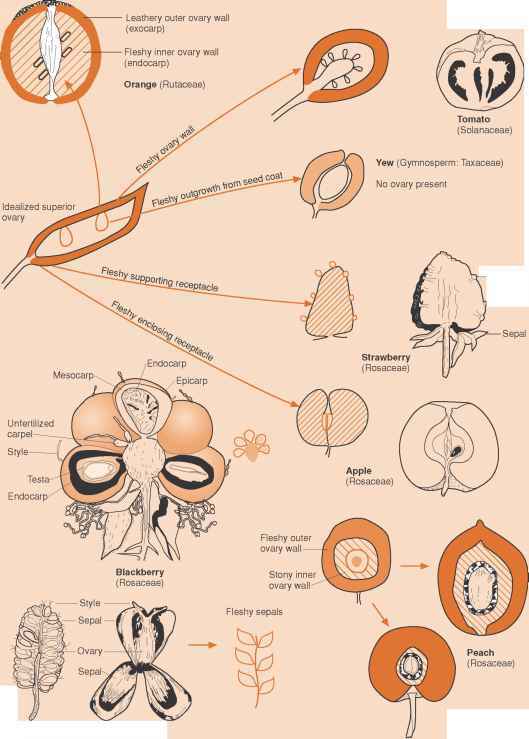 Hence, the feeding state of the individual cells can alter the probability of blooms of N. scintillans occurring at the surface. The term interception feeder is often used to imply that only particles in streamlines no more than one particle radius away from the feeding structure are intercepted [68,69]. In reality, electrodynamic, electrostatic, solvation, or steric forces may result in the particle being attracted or repelled, and so may cause it to cross streamlines, which theoretically may greatly affect particle retention rates . Experimentally, it has been shown that the hydrophobicity of the bacteria may indeed affect feeding rates . For small particles, diffusion encounter may also be of importance , even for swimming cells. In filter feeding, the organism makes use of a filtering structure through which water is sieved by the motion of the organism or the generation of feeding currents. All particles larger than the distance between filtering elements are removed from the flow and transported to the "mouth." Particles smaller than this may also be removed if they make contact with and stick to the feeding structures in the same way as described for interception feeding. Thus, the feeding mechanisms may be overlapping. Filter feeding is used by a large number of species, including many ciliates as well as numerous flagellates such as choanoflagellates and pedinellids. The filter element can be composed of cilia, as is the case in ciliates, or pseudopodia in the case of flagellates. Turbulence may in theory increase the contact rate, and thus the feeding rate, of aquatic organisms by increasing the relative velocity of predator and prey . It is not clear, however, whether turbulence in reality has a positive effect on feeding rate, even among larger organisms such as copepods. This is, among other things, because turbulence may disturb the feeding currents and alter the behavior of the organisms (e.g., Refs. [74,75]). For protozoa and bacteria, which are well below the Kolmogorov length scale and so live in a world of laminar flow, the picture is even more obscure. There have been reports of increased feeding rates of some flagellates in the presence of turbulence [76,77], but they are not entirely convincing. To some extent, the increased feeding rate could be related to the flagellates' increase in numbers but decrease in size in the presence of turbulence . Thus, although it seems that turbulence does affect the microbial ecosystems, I will largely ignore it in this review because the nature of this phenomenon is as yet very poorly understood. A majority of the heterotrophic species of most pelagic microbial ecosystems are filter feeders. Many overlap in the particles that they are capable of ingesting, and yet they coexist. In systems of larger animals, this would not be possible because one species would tend to outcompete the others. The reason why this is possible can be found in the nature of filter feeding at low Reynolds numbers, which is illustrated here by a simplified model. where U0 is the velocity of the fluid when unrestricted by the filter, Ap is the pressure drop over the filter, x equals nd/b (where d is the diameter of the individual filtering elements and b is the distance between the centers of adjacent filtering elements) (Figure 13.7), and pi is the viscosity of the fluid. Assuming that the filtering elements are rigid, filter feeders can retain any particle with a diameter larger than b. Particles smaller than this can only be retained if they make contact with and are intercepted by the filtering element. In reality, it seems that only very few particles smaller than b are intercepted by filter feeders [81,82]. 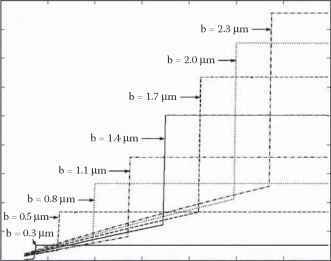 Thus, there is a trade-off: the greater the distance between filtering elements, the larger the velocity and hence volume of fluid filtered for particles, but the smaller the proportion of the particles that are retained. The power loss in driving fluid through a filter can be found by using Equation 13.3. FIGURE 13.7 An idealized filter feeder as used in the model. Water enters the opening of the filter at velocity U0 and passes out through the sides at a lower velocity as a result of the energy loss due to the pressure drop over the filtering elements. Particles in the water are intercepted by the filtering elements. The distance between the centers of adjacent filtering elements is given by b, and the diameter of the cylindrical filtering elements is given by d.
where P is the power loss and a is the area of the surface of the cylinder spanned by the feeding elements. The growth rate of filter-feeding protozoa with various distances between adjacent filtering elements as a function of the size of the bacterium is presented in Figure 13.8. The calculations were based on the following assumptions. The pressure drop over the filtering structure is in all cases assumed constant at 1 N m-2. The distances between adjacent filtering elements varies from 0.2 to 1.2 ^m and are evenly distributed in this interval. The radii of the bacteria vary from 0.1 to 1.4 ^m. As the size of the bacterium changes, the total bacterial volume is held constant at 0.11 x 1013 ^m3 m-3, equivalent to 1013 bacteria per cubic meter at a radius of the bacteria of 0.3 ^m. This number was chosen because it has been shown to be well above that required for balanced growth in protozoa (e.g., Refs. [52,60]). Because the total volume is held constant, the number changes from 2.7 x 1014 to 1 x 1011 m-3 as the radius of the bacteria changes from 0.1 to 1.4. This was done for comparative purposes to avoid an excessive increase in the growth rate of all the protozoa with increasing bacterial volume. FIGURE 13.8 Growth rate of protozoan filter feeders as a function of the size of the food particles. The growth rate is calculated for different filter feeders with distances b between the centers of adjacent filtering elements ranging from 0.3 to 2.3 ^m. ingestion of 100% of the cell volume of the protozoa per hour since this seems an amount that is more realistic for filter feeders (e.g., Refs. [52,82]). As can be seen in Figure 13.8, all of the protozoa have a positive growth rate at any of the sizes of bacteria. For the individual protozoon, the growth rate increases gradually with bacterial size until this exceeds the distance between filter elements. Here, there is a jump in growth rate marking the difference between being an inefficient interception feeder and being capable of retaining all the particles by means of the filter. After this there is no further increase in growth rate because the volume of bacteria per cubic meter is constant. Though all of the protozoa have positive growth rates with every size of bacteria, they each have a unique size range in which they have a maximum growth rate. Analogously, it is possible to calculate the number of bacteria ingested by each of the protozoa, assuming an equal number of bacteria in each bacterial size class. Though all of the protozoa are ingesting bacteria of every size, each is the main predator for a size range of bacteria and for this size range ingests the largest number of bacteria. petitive advantage. They are then present to take advantage of possible changing conditions. The system of filter feeders is dynamic because a large number of any given type of protozoa will tend to result in the "grazing down" of the size range of bacteria on which it is the dominant predator. This is especially true for protozoa specializing in larger food particles because of the much higher clearance rates. This can be illustrated by looking at the development over time in a system starting off with 1012 bacteria per cubic meter of each of the nine size groups described above, and 108 protozoa per cubic meter with each corresponding distance between filtering elements (Figures 13.9A and 9B). Bacteria are assumed to have a growth rate of 0.05 h1. The modeling has been done computationally with time steps of 120 sec. Larger bacteria are grazed down much more quickly than smaller ones, with only the smallest having positive growth rates under these conditions. In addition, the relative growth rates of the different types of protozoa change over time as the relative size distribution of the bacteria changes. 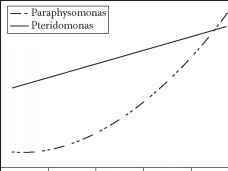 FIGURE 13.9 Development over time in (a) the growth rate of protozoa and (b) bacterial concentration. The distance between the surface of adjacent filtering elements (function of b and d) as well as the size of the bacteria range from 0.2 ^m (solid line with no markers) to 2.3 ^m (lines with solid circles) with steps of 0.3 ^m between size groups. The larger bacteria are grazed down faster, and so the relative growth rate of filter feeders with smaller distances between filtering elements compared to those with larger distances increases. Much organic matter in pelagic ecosystems is found in the form of aggregates, or particulate organic matter (POM). As these sediment out of the pelagic zone, they constitute a major pathway for loss of organic carbon from pelagic ecosystems. Many protozoa as well as bacteria attach to the surfaces of POM using mucus threads, flagella, or cilia. Bacteria associated with aggregates are to a large extent responsible for the degradation of the aggregates that occur while sinking to the seafloor  and are therefore important in recycling organic matter and nutrients to this system. The colonization of aggregates by bacteria is facilitated by the chemotactic behavior of some bacteria [84,85]. The colonization rate may be either positively  or negatively  affected by the presence of other bacteria on the aggregates.Much of the reason for the attachment of microbes to aggregates can undoubtedly be found in their wealth of organic matter. Bacteria feed directly on the organic matter of the aggregate, and flagellates feed on attached or suspended bacteria associated with the aggregates (e.g., Refs. [88,89]). Because the flagellates seem capable of controlling the bacterial communities, they affect the rate of degradation of the particles. Ciliates may in turn feed on the flagellate community, and aggregates in the pelagic environment are typically associated with diverse microbial communities [90-92]. Though microorganisms in this way may attach to remain in an environment that is advantageous for feeding purposes, protozoa not only attach to organic particles or in the presence of food particles, but also attach to glass or other artificial surfaces; they may even attach to inorganic surfaces in sterile water [54,93]. Hence, there must be additional reasons for attachment. Attaching during feeding has important fluid dynamical implications, and they may in some cases be the main reason for attachment. Swimming microorganisms produce thrust only to overcome the drag of the cell body and so produce only local flow fields . When motile organisms are attached to particles, the force they produce against the fluid will result in thrust balancing the drag of the particle to which it is attached, thus generating a large-scale flow field around the attached organism. With the same application of force, the velocity of the fluid past the feeding structure of the organism may be higher if attached and generating feeding currents than if free swimming (Figure 13.10). In this way, it may be advantageous from a fluid dynamical point of view for microorganisms to be attached, as measured by an increase in the feeding rate compared to the energy expenditure, even if the bacterial concentration around the aggregate is no higher than ambient concentrations . This has also been shown for copepods  as well as ciliates . FIGURE 13.10 Increase in the filtration efficiency of flagellates when attaching to particles. The average velocity of the fluid past the feeding appendages, and hence the potential feeding efficiency, is shown as a function of how large a fraction of the velocity results from feeding currents as opposed to forward velocity of the cell. This ranges from 0 in the case of completely free-swimming cells to 1 for cells attached to particles that are too large for them to pull. The curves are calculated from data presented in Christensen-Dalsgaard, K.K. and Fenchel, T., Aquat. Microb. Ecol., 33, 77, 2003.
. Even in species without contractile stalks, chaotic flow patterns might increase feeding rates . The large-scale flow fields of attached organisms make fluid dynamical interactions between feeding currents of adjacent cells possible and so the generation of communal currents. Though intuitively this would seem an advantage, it may not necessarily be so. For bryozoans, which obviously are not protozoans but also generate flow at low Reynolds numbers, it has been shown theoretically that the hydrodynamic interactions between zooids have negative effects on the ability of the individual zooids to generate feeding currents. This is due to a high pressure in the interior part of the colony caused by the viscous resistance to excurrant flow . It may be possible to reduce this effect by forming communal holes for the outflow of water  in a manner similar to that of chimney-forming bryozoans . Further research is needed to understand the effect of fluid dynamical interactions between organisms on aggregates, which presents a very different system to the dense and planar colonies of bryozoans. Even less clear is the net effect of attachment on the predation on protozoa. Attaching reduces or eliminates the forward velocity of the cell and, in this way, reduces the probability of encountering a predator. But at the same time, the large scale flow field of the attached protozoa will make them more visible to predators that perceive their prey through hydrodynamical signals. Also, because copepods feed on organic aggregates, which they find though the plume of dissolved substances tailing behind the aggregate , attached protozoa may be eaten as a by-product. Attached bacteria, which enhance the degradation of the aggregates, increase the "visibility" of these aggregates to copepods and the chance that the aggregates may be eaten. So the overall effect of attachment on predation is not clear.